We use them each and every day, and they’ve been around for millennia. Yet many know very little about the small mechanics in place when we use them. Here is a brief look at the common pin tumbler lock—also known as the Yale lock—so that you can see how a lock keeps a door closed and how a key works to unlock it. Early versions of the pin tumbler lock date as far back as 4000 BC in Egypt. The locks of this era were constructed with two pieces of wood set together in cross-like orientation. One wooden piece was affixed vertically to the door, and then a horizontal bolt slid into this piece. Within the vertical piece, and extending down into the horizontal bolt, were vertical openings into which pins would be fitted. These pins would hang down into the large opening where a wooden key could be inserted. The wooden key was shaped as such that it could be inserted into the horizontal bolt and push these individual pins upward, at which point the bolt could move and unlock the door. This special type of lock shaped the way locks were made into the modern era. During the 19th century, inventors began to get patents for locks modeled after the original Egyptian pin tumbler lock. And in 1848, Linus Yale, Sr. invented the modern pin-tumbler lock. His son, Linus Yale, Jr., ended up inventing and patenting a smaller type of key for use in these locks. This new key featured serrated edges that would fit into a lock with pins of varying lengths—the same design that is still in use today. 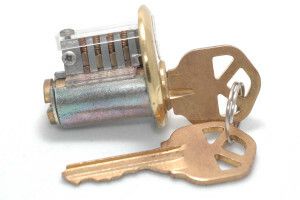 The pin tumbler lock mechanism is most commonly seen in a cylinder lock. The lock mechanism fits inside a plugwithin this cylinder, and the plug must be rotated in order to unlock the door. At one end of the plug is the keyway, which is the straight-shaped opening in which a key is inserted, and at the other end of the plug is a lever, which activates the mechanism that retracts the locking bolt. In the middle of the plug are six holes drilled vertically that fit key pins of various lengths. These key pins are rounded at the ends to allow the serrated edge of the key to slide past them easily, and above these pins are spring-loaded driver pins that allow them to move upward easily. When the proper key is inserted into the keyway, its serrated edge lines up perfectly with the various key pins and creates a flush line at the division between the key pins and the driver pins. This line lines up with the shear line of the lock mechanism, allowing the plug to rotate and thus open the lock.